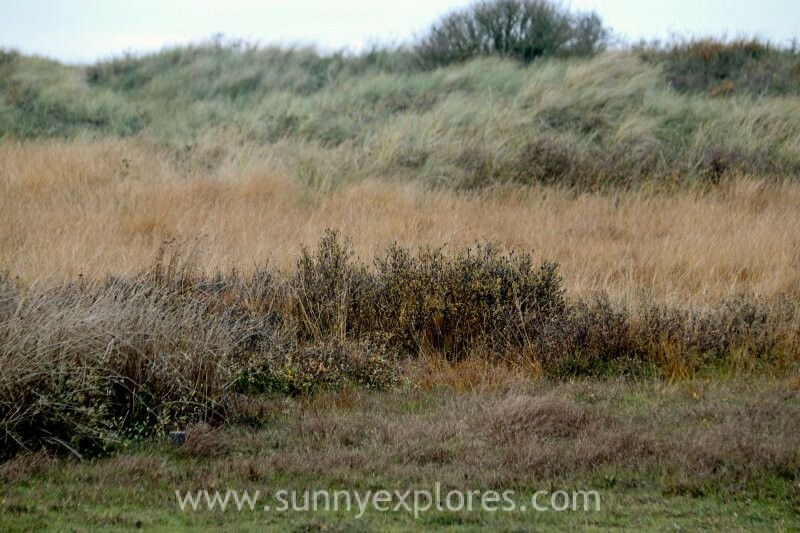 About 2 years ago I wrote a travelblog about the Dutch waddenisland Ameland: 6 reasons to visit the island Ameland in Holland. This month I spent another week at this island: time for another blog. 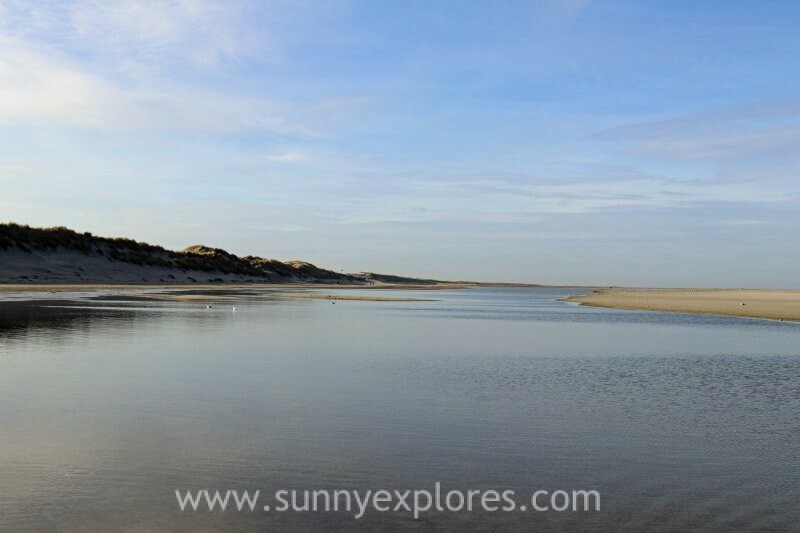 Here are 6 more reasons to visit Ameland. 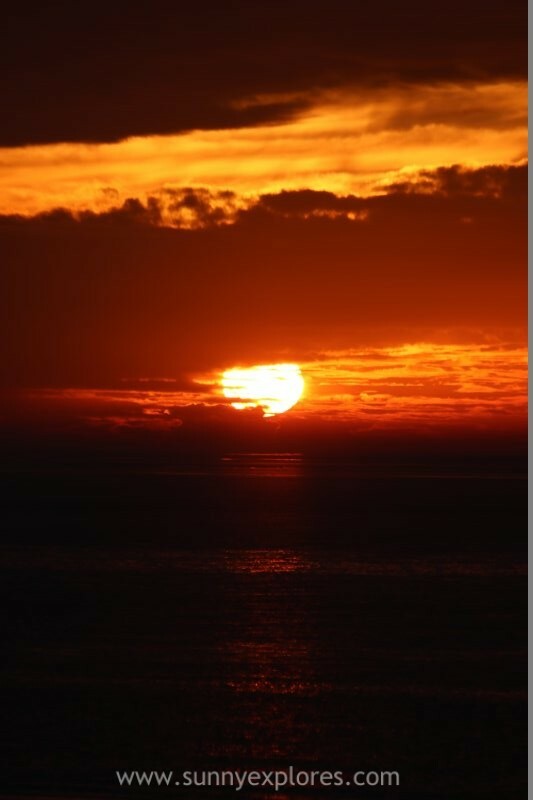 A special natural phenomenon has occurred on the North Sea beach of Ballum. The sea current has created an inland sea here. The bornrif, a sand eruption on the northwest side of the island, has moved upwards due to the strong current. 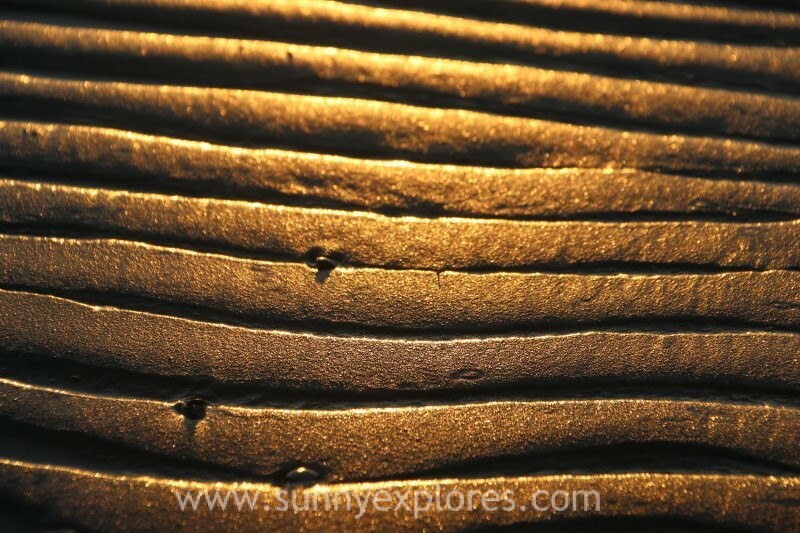 This created a sandbank in the shape of a hook. This inland sea contains 17 million cubic meters of sand. And 2.3 million cubic meters of seawater enter the channel every tide. The nature center in Nes offers various exhibitions related to the nature and wildlife in the divers wadden landscapes. 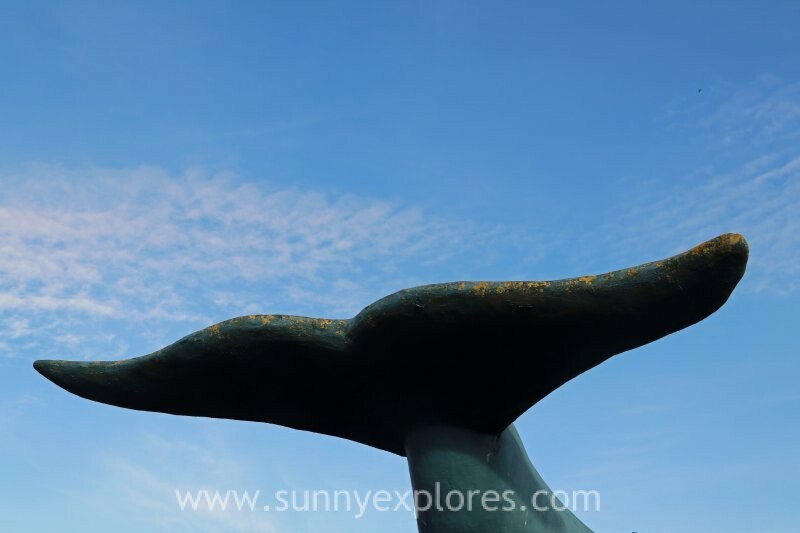 Most interesting is the exhibition about the 4 sperm whales that washed ashore in 1997 on the Ameland beach. The 20 meters long skeleton of one of these sperm whales is displayed and you can also watch a bloody video how the intestines of one of the animals exploded. Hiking is a good way to discover the island. The many hiking trails meander through the salt marshes, along the mudflats, through the villages, into the dunes and the beach. 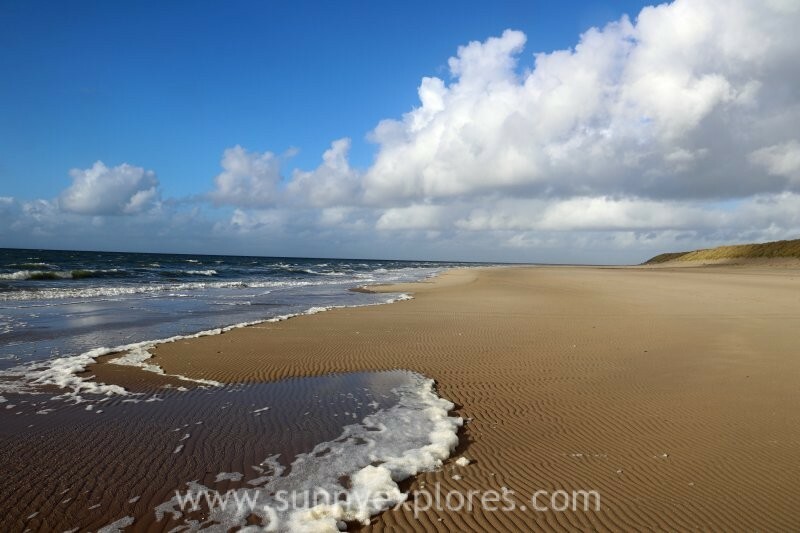 The Kooiduinen have beautiful transitions from dry dunes to salty marshes and to humid lowlands between the dunes. In every season there is something new to explore. In my previous blog I wrote about the impressive launching of the rescue boat, pulled by ten horses. 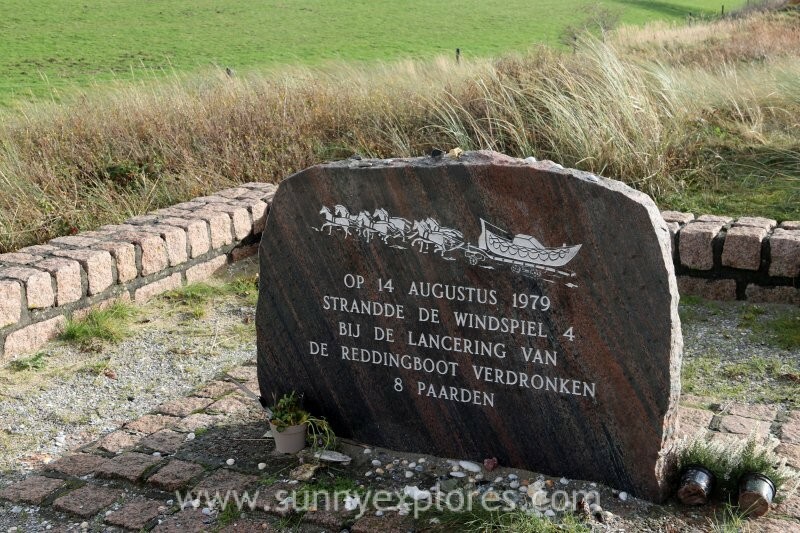 If you want to learn more about the maritime history and the disasters with ships around Ameland you can visit the Maritiem center. Here you can also embark on the rescue boat. In the dunes of Hollum you can visit the grave of eight brave rescue horses. In 1976 the raging sea claimed the lives of these horses when a rescue went terribly wrong. The islanders have always lived together with the sea. In the cemetery of Hollum many sailors are buried, and that shows on the memorial stones. 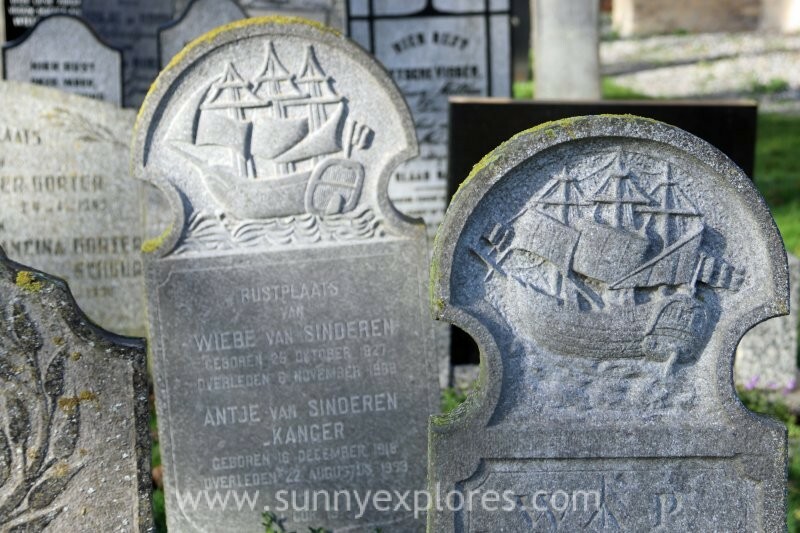 On different graves you can see boats and the sea. The most simple stone is the one from H.D. Kat, one of Amelands whalers. In 1777 he got stuck in the ice around Greenland. After a cold adventure 18 of the 51 crew members returned home after a rough journey of months and a stay with the Eskimos. This time on the island I discovered the best place for sunset watching: the Sunset Beach Club. On clear evenings some people gather on the platform before the beach club to watch the sun set. Do you prefer to have the beach all to yourself, then take a beach entrance before this one in the direction of the horse grave. The view is even more beautiful here and the beach is all all yours!